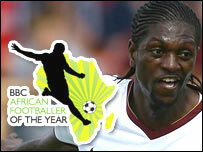 Emmanuel Adebayor has won the 2007 BBC African Footballer of the Year award after a public vote. The Togo striker garnered almost 42% of the vote, beating Didier Drogba of the Ivory Coast into second place. 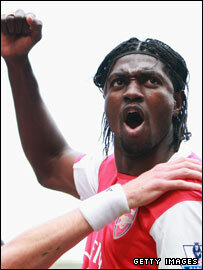 An inspirational figure, Adebayor has been the sharpest of strikers for English Premier League title-chasers Arsenal, scoring 13 goals this term. Ghana's Michael Essien, last year's winner, finished third ahead of Mali's Freddie Kanoute. Cameroon and Barcelona striker Samuel Eto'o finished fifth. The 2007 shortlist of five players was drawn up by football experts from every country in Africa, based on players' individuality, skill, technical ability, teamwork, consistency and fair play. After the bitterness he felt at failing to lead Togo to the Africa Cup of Nations finals, Adebayor can at least take some consolation at winning one of the most prestigious prizes in African sport. Previous winners include Ghana's Michael Essien and Sammy Kufuor, Mohamed Barakat of Egypt, Senegal's El Hadji Diouf, and Nigeria's Jay-Jay Okocha. The lanky goal-getter from Lome made his debut for French league side Metz at just 17 and scooped a (European) Champions League runners-up medal in 2004 after moving to Monaco. He has twice been nominated as the Confederation of African Football's Player of the Year and his 11 goals for Togo in qualifying for the 2006 World Cup was the best on the continent.